Kärcher's 92% efficient top-fired burner delivers more heat from less fuel for the lowest operating costs in the industry. Proprietary scale inhibiting system prevents build-up of mineral deposits inside the coil. Industrial-duty, tri-plunger, oil-bath, belt-drive Kärcher KT pump with 7-year warranty. Includes a brass pump head, and Tru-Trak belt adjustments. Operates at a low RPM for low-maintenance operation and long life. Includes safety relief valve to protect pump from overheating and excessive pressure build up. 50' Kärcher high-pressure steam hose rated for 311° F connected to the trigger gun with an integrated swivel connection. Easy-Press trigger gun with soft-grip minimizes operator fatigue. Insulated Kärcher pivoting spray wand with a unique 25° Power Nozzle that delivers 40% more cleaning power due to even-impact spray pattern. Built-in variable steam valve creates steam spray of up to 285° F.
Detergent metering valve allows for variable application of soap while washing in high-pressure mode. Reliable gas-powered 20 HP Honda engine with electric start. Heavy-gauge steel frame with powder coat finish for all-weather protection, with vibration isolators and forklift guides. 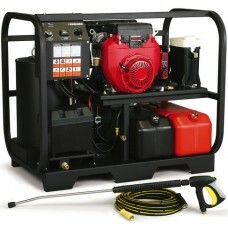 Pressure washer has variable operating pressure, water volume, temperature control, and detergent metering. Kärcher safety features include pressure switches, rupture disk, low-water and low-fuel protection that shuts down burner when incoming water and fuel are insufficient or interrupted. ETL certified to rigid UL-1776 and CSA 22.2 safety standards.